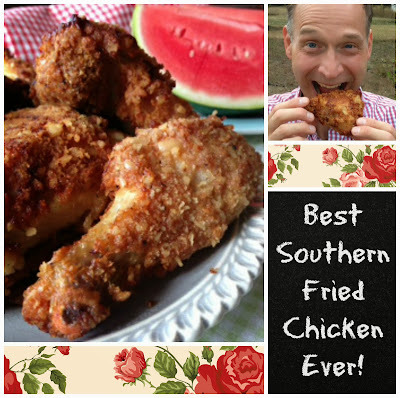 Best Southern fried-to-perfection chicken recipe! We're liberated! My husband, George, and I tried a special diet a while back: mostly beans and veggies (gag-me-with-a-burrito boring!). We got to where neither of us wanted to look another bean salad or burrito in the face! "I want so bad to sink my teeth into a piece of Southern fried chicken," George would say on a daily basis after several weeks of beans had passed (and that's not all that passed, if you get my drift!). I had to agree: No more beans (at least for a while). So one day, I surprised us both. I made some of the crispiest, tastiest Southern fried chicken either of us had ever eaten. My honey LOVED it! And you will too, because I'm going to tell you how to make it. Step 1: Heat 1 inch oil in a large heavy frying pan or skillet to just below the smoking point. Step 2: While the oil heats, place the oyster crackers in a large plastic bag and crush with a rolling pin until you have fine crumbs. Step 3: Add to the crumbs the baking powder, garlic powder, salt, poultry seasoning, and black pepper. Close the bag and shake until well mixed. Step 4: In a wide shallow bowl, place the beaten eggs and milk. Whisk together. Step 5: Spread the flour on a plate. Roll 1 chicken piece at time in the flour until coated. Then place each piece, 1 at a time, in the bag of crumbs and seasoning. Shake until the piece is thoroughly covered. Repeat with each piece of chicken. Step 6: Starting with the dark meat pieces first, place the chicken in the heated oil. Allow the dark pieces to cook 5 minutes, before adding the white meat pieces. Avoid over crowding. Cover the pan with a lid or screen and continue frying for an additional 15 to 20 minutes. Turn the meat once about half-way through the cooking time. Cook until browned on all sides.